No hard hats needed here. We’re just going to pretend to build with these blocks. Circle the set in each row that has less blocks than the other set. Color. What buildings can you see? 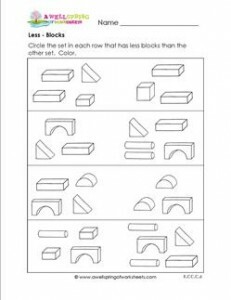 Please go to this page to see all the more and less worksheets in this set.